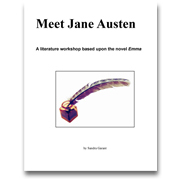 Based on the novel Emma, the Jane Austen workshop was especially written for young ladies ages 13 to 18. Enter Jane Austen's world with the help of the wealthy and sometimes wrong-headed Emma Woodhouse. Emma learns to distinguish between her own fanciful notions and reality as she tries to rearrange the lives of her friends and relations. Enjoy learning about manners, history, vocabulary and more in this workshop. Buy or borrow a copy of Emma to use with the workshop.